Hey! Thanks for the welcome back! Happy you enjoyed this post. Have enjoyed your recent posts on BC hotels. Headed to Rockwater Secret Cove on the Sunshine Coast soon — not lux enough to make your list, but looks pretty cool! Will post some photos when we’re there. Thanks! LOL! Totally laughing at our shared U-Haul moment! It was not easy and I was sure we were going to get pulled over. But the risk was worth it. I had no idea how cool this place is when it’s not covered with water. So great when traveling surprises us with unexpected delights like this one. Thanks for the welcome back! I need to catch up on my reading — will stop by and see what you’ve been up to. Hope you’re enjoying your summer! Hugs! ~K. Hey beauty! Thanks! Plenty of time to look at ALL the photos from here when you come to visit in August!! Can’t wait to hang out, catch up and take more photos! See you soon! ♥ K. P.S. Need to catch up about Wanderlust. Booked a room in Whistler for Fri/Sat with miles — was soooo $$$$$ otherwise. Will shoot you an email! Hey! Thanks, Andrew! Hope you’ve been surviving June-uary! So dreary! Looks like we might finally get some sunnier weather this week. Bring on summer! Your first photo is a real attention-getter. Great job on this challenge. Thank you, Allan! I shot that photo at high speed as we got back on the highway. The scale of the car and the people was so cool on the endless white. Thanks for your comment! Wow! Thanks for the followup. Perspective is everything. Hey kiddo those are some great pictures! Could easily be mistaken for snow. Good to know you’ve been traveling. 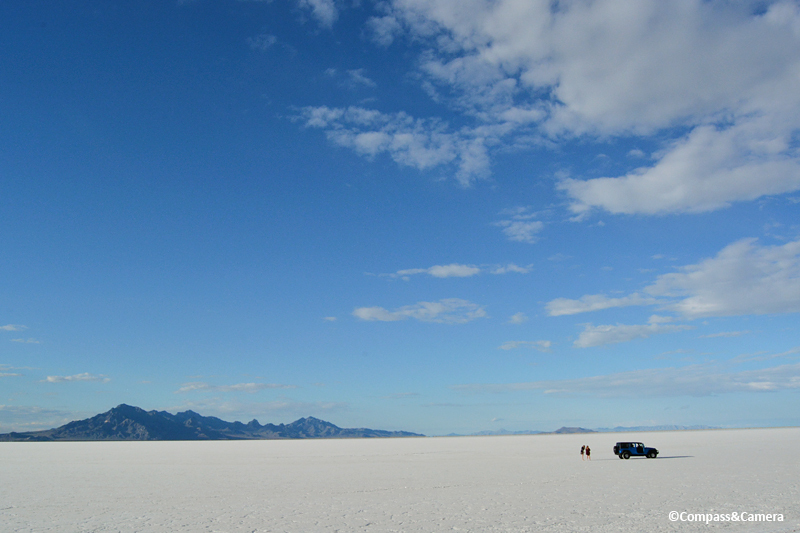 Judging from your photos, the Bonneville Salt Flats remind me of Salar de Uyuni in Bolivia — I’ve never been to either place, though. I like when you said you’re on the top of the bottom, which technically is also the case with the Himalayas. Great photos, Kelly! and looking forward to more posts from your recent travels. I love places like this! It reminded me of Uyuni of course and the salt flats there. Welcome back! Let’s have lunch – I’ll email you. Thanks, Alison! Good to be back for a bit. Headed to Tahoe next week. Uyuni?! I don’t think I’ve heard of that place. I’ll have to search your blog and learn more! Got your email. Will reply tomorrow. Thanks! So cool! How have I never heard of this place? Good question, Diana. My guess is that unless someone is familiar with the Bonneville Speedway, they probably haven’t heard about the Salt Flats. I sort of knew about them but it wasn’t until we were driving through them that I really grasped what a cool place it is. Thanks for your comment! These pictures are stunning – reminded me of the Rann of Kutch. Looking forward to your posts! Thanks, Ratika! Is the Rann of Kutch also a salt flat? I’ve never heard of it. Will do some research! Thanks for your comment! It’s a seasonal salt marsh. Stunning during the day as well as in moonlight. It’s on my bucket list – hopefully, I’ll go there next summer. It’s definitely worth a visit! Earlier this year, I posted about my trip there in July 2015. It is fascinating so see the same images from another month. The venue is so striking and peaceful. As I wrote in my post, If I had a comfortable chair, I could just sit out there for hours and just stare. Hey, scenethat! I would love to read your post! Send the link if you have a chance. I agree — it’s an other-wordly cool place. Thanks for your comment! Great photos, and an informative narrative. Great story! Love your capture of the evaporation trails. Hey! Thank you! Hope you enjoyed the long weekend.